Sunset pictures from lake Tansen, Sweden. May 2000! Pictures from Sweden, July 2002! 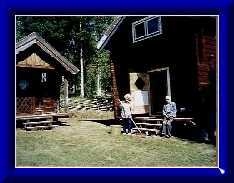 Pictures from Sweden, August 2003! 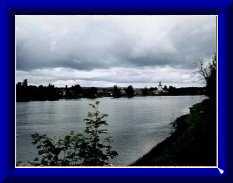 My pictures of the flood we had July 26, 2003 in Ontario, Oregon. Hi! My name is Gunilla Manell. I come originally from Lidingö, Sweden. That explains the Swedish flag at the top of the page. Although I have become an American citizen, my heart beats for Sweden and the Swedish flag. The picture to the left shows Mom & Dad in front of Härbret in Mockfjärd. The other one to the right shows Dala-Floda Kyrka across Dalälven. My mom and Dad were married in that church, so it is kind of special. Please let me know that you were here! One of the purposes for this page is for family and friends to be able to see some of my pictures. You can also see my Famy Tree, if you follow the link.